Pacific Highlands Ranch features a number of indoor and outdoor recreational options, providing opportunities for fitness enhancement and active living, group sports and family and community gatherings. 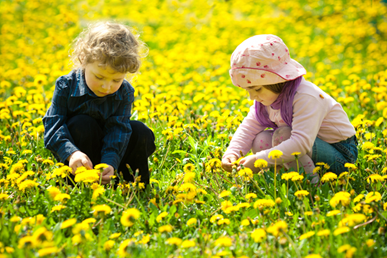 Continue reading to learn more about the natural and active open space and recreational facilities available in the community. 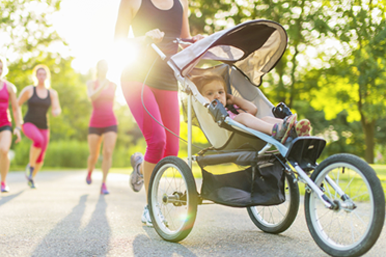 Running, biking and hiking trails are interwoven throughout the community, offering scenic routes and mountain views to those engaging in outdoor recreation. 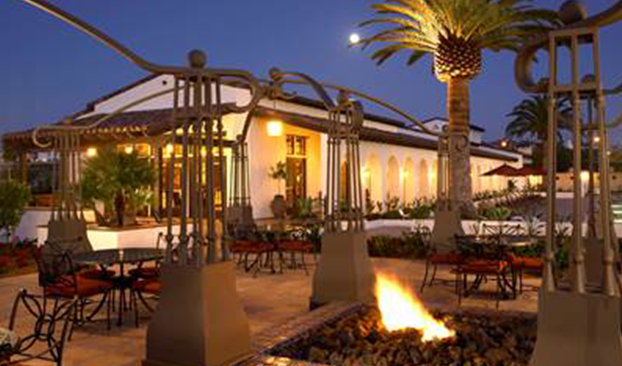 Pacific Highlands Ranch offers open space, and Southern California mountain and valley views. Pacific Highlands Ranch is home to 15 miles of interconnected pedestrian, bicycle and equestrian trails. The trails provide critical connections to a larger network of multi-use paths within the adjacent open space parks, canyons, and preserves including the Carmel Mountain Preserve Los Peñasquitos Canyon Preserve, Del Mar Mesa Preserve, Gonzalez Canyon, Black Mountain Open Space and others. Additionally Pacific Highlands Ranch is in close proximity to the State Route 56 Bike Trail a seven-mile traffic-separated path with connectivity to Torrey Pines State Beach via Carmel Valley Road to the west and Interstate 15 close communities of Rancho Peñasquitos, Carmel Mountain Ranch, Sabre Springs and Poway to the east. 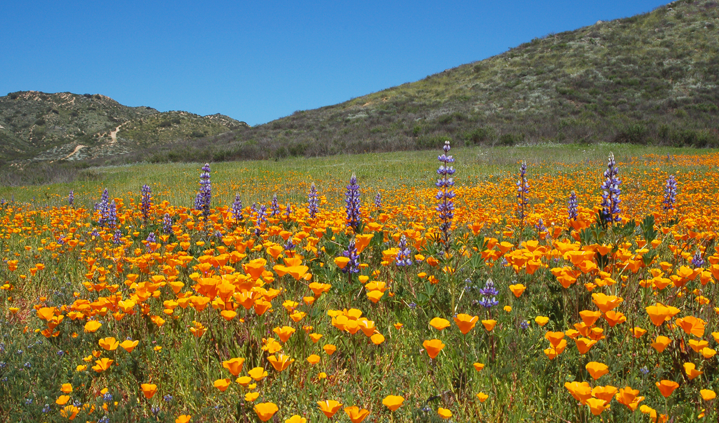 A 150-acre portion of the Carmel Mountain Preserve is located within Pacific Highlands Ranch, The mesa top is home to some of the region’s rarest plant species. Interconnected multi-use trails provide access to the community trail system, the Carmel Valley Recreational and Equestrian Path and Los Peñasquitos Canyon. A trail map can be found here. A system of multi-use trails accommodating hiking, biking, and riding provides Pacific Highlands Ranch residents with more than convenient exercise options. The interconnected trail network allows residents to easily access neighborhoods schools, retail shops and restaurants and local parks without ever getting in their cars. 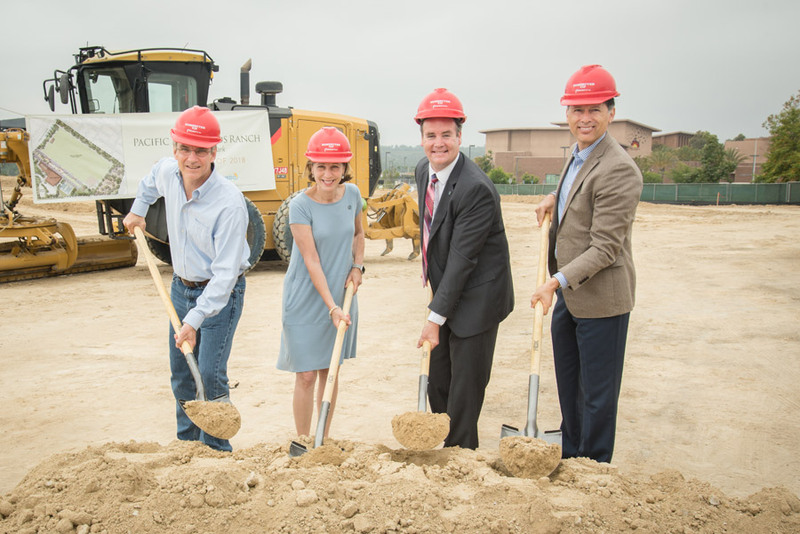 Carmel Valley Planning Board member Ken Farinsky, District 1 Councilmember Barbara Bry, Assistant Park and Recreation Director Andrew Field and Pardee Homes Division President Jimmy Ayala breaking ground at the site of the Pacific Highlands Ranch Community Park. The Carmel Valley Recreation Center is responsible for managing activities and events at local parks, including reserving fields and space for parties. Please call the Carmel Valley Recreation Center at (858) 522-1616 with any questions about use or reservation of park space. Solana Ranch Park, one of two five-acre neighborhood parks planned for Pacific Highlands Ranch, opened in March 2015. Located adjacent to Solana Ranch Elementary, the park is ideally situated to serve residents living in the community's north end. Solana Ranch Park offers a number of active and passive recreational amenities, including a multi-use play field, picnic tables, grassy amphitheater space, a half-basketball court, a walking loop and a children's playground, among other features. Visitors driving to the park are permitted to park in the elementary school lot. Construction began on the Pacific Highlands Ranch Community Park in June 2017. The park is located adjacent to Canyon Crest Academy and Pacific Trails Middle School and directly across from the Village at Pacific Highlands Ranch. The park was designed through a collaborative process that engaged the community and solicited valuable feedback from residents. 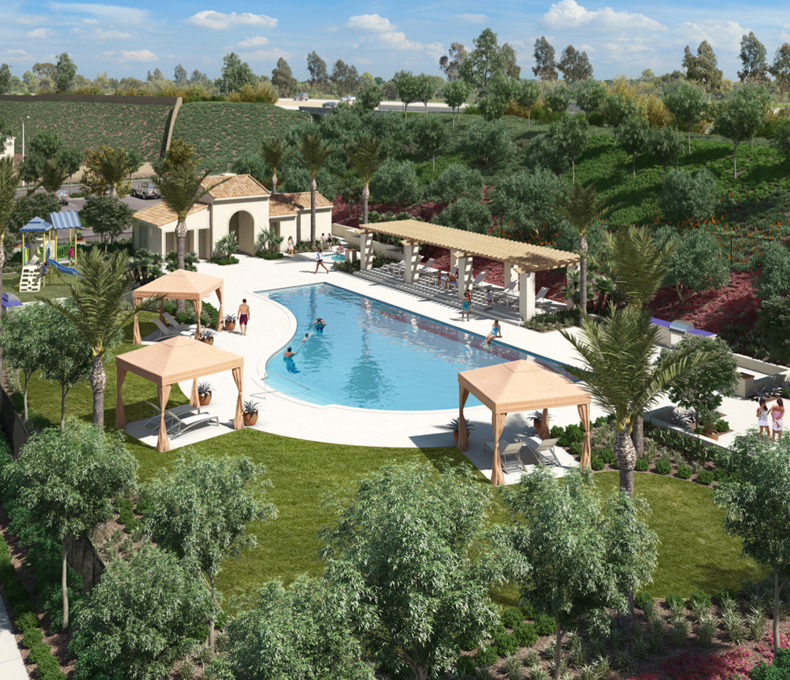 The final design received unanimous approval from the Carmel Valley Recreation Council, the Pacific Highlands Ranch Community Park Advisory Committee and the City of San Diego's Park & Recreation Board. 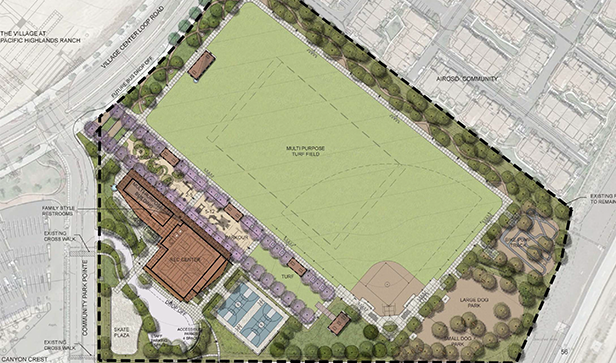 The 13-acre park features a large turf field that will be able to accommodate a variety of sports, a recreation center, small and large dog parks, a traditional children's playground and discovery play area, and a skate plaza, as well as unique amenities such as the first free public parkour area and bike pump track in the City of San Diego. The park's design also includes a central promenade that connects the park to The Village. The park's walkways and connections to its surroundings complement and promote the community's walkability; those driving to the park will be able to use the adjacent school lots. The park is now open to residents of the Pacific Highlands Ranch community. As the master developer of Pacific Highlands Ranch, Pardee Homes completed the work for the new park. The park was funded through the Pacific Highlands Ranch Facilities Benefit Assessment, which is made up of contributions from developers and used to pay for public facilities, traffic calming features and other improvements. A second five-acre neighborhood park is planned for residents living in the community's east end. A joint-use facility, it will be located adjacent to one of the two remaining elementary school sites. The West Highland Pacific Recreational Center is a private recreation center located across from Solana Ranch Elementary in the northern portion of Pacific Highlands Ranch. The 8,825 square-foot center provides a resort-like atmosphere and offers a Junior Olympic size pool, spa, fitness and club rooms, a multi-purpose and covered outdoor room and a children's water play area. The Club at Lopelia Meadows is now open to residents of four communities from the Pacific Highlands Ranch neighborhood. Communities include Almeria, Olvera, Artesana and Watermark. The 6,580 square foot Club features a variety of resort-style luxurious amenities including a lap-pool, barbeque areas, fitness center, shaded cabanas and a multi-purpose area. This new facility also offers a clubhouse for guests to host private or community gatherings. 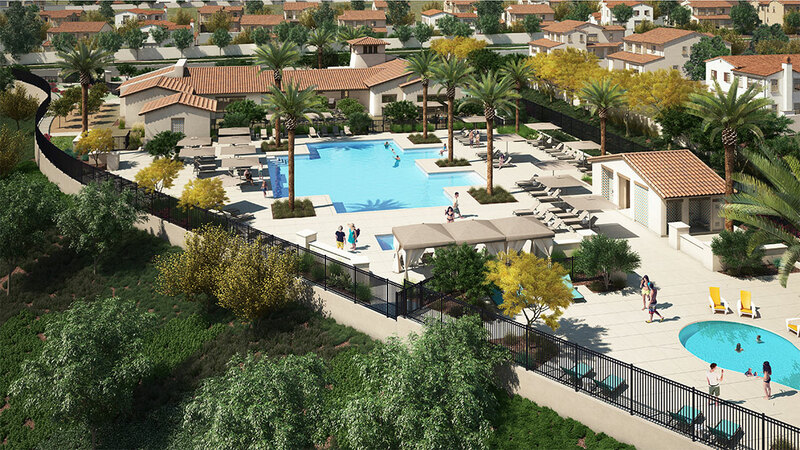 Neighboring The Village at Pacific Highlands Ranch, Solana Ranch Elementary and Solana Ranch Park, The Club at Lopelia Meadows serves as a site for residents to come together in the community. Plans are currently underway for a 17,000 square-foot public recreation center, to be developed as part of the community park. The center will be situated on the southwestern edge of the park and will feature a central gymnasium, a multi-purpose room, and an outdoor courtyard, all conducive to athletic and community-based endeavors. Plans for the center were developed as part of the citizens committee design process. The center is expected to open in 2019. Details on the planning process and the committee-endorsed center design can be found here.